Best Western Plus Lake Kawana Hotel has 81 rooms offering both corporate and leisure guests a high-quality accommodation experience with a number of room options, including Deluxe and Executive rooms and suites. Reception is open 24 hours a day, seven days a week and they free wi-fi and Foxtel. The hotel is conveniently located in the heart of the Sunshine Coast, next to the New Sunshine Coast University Hospital and Sunshine Coast University Private Hospital. Close to all of the major coastal attractions, five minutes from Sunshine Coast Stadium and it is also only 20 minutes from the Sunshine Coast Airport and 10 minutes to the pristine beaches and the retail hub of both Mooloolaba and Caloundra. Birtinya Shopping Centre is just a short walk from the hospital. Award Winning Wildflower Restaurant + Bar offer fantastic food experiences breakfast and dinner seven days a week and lunch five days. 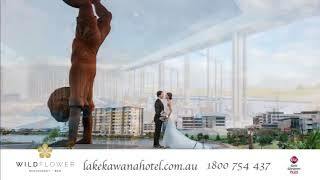 Two meeting rooms both with fantastic water views that will make your wedding, meeting or function memorable. The hotel is part of the new Oceanside Kawana Health complex and is an easy stroll to Sunshine Coasts new Public and Private Hospital.